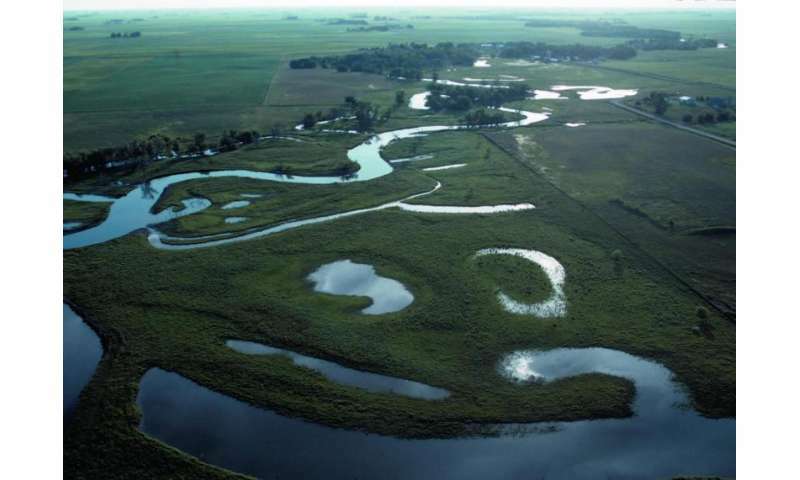 According to a new study from Oregon State University, restoration of wetlands in the Midwest has the potential to significantly reduce peak river flows during floods—not only now, but also in the future if heavy rains continue to increase in intensity. Wetland restoration could also provide a small step toward a hydrologic regime in this region that more closely resembles its historic nature, before roads and cities were constructed, forests were lost, and millions of acres tile-drained to increase agricultural production. An evaluation of potential wetlands in one watershed in central Indiana found that if just 1.5 percent of the land were used for wetlands, the peak flow of the overall watershed could be reduced by up to 17.5 percent. Also of importance, researchers said, is that expansion of wetlands appears to provide significant benefits across a wide range of possible climate scenarios. The study was published in Ecological Engineering, in work supported by the National Science Foundation and the National Oceanic and Atmospheric Administration. "Flood management in the Midwest is now almost entirely concentrated on use of dams and levees," said Meghna Babbar-Sebens, an assistant professor of civil engineering in the College of Engineering, and the Eric H.I. and Janice Hoffman Faculty Scholar at OSU. "Wetland construction or restoration could provide a natural and ecological option to help with flood concerns, and serve as an additional tool for flood management. Greater investments in this approach, or similar approaches that increase storage of water in the upper landscape of a watershed, should be seriously considered." The new research considered not just the problem now - which is serious—but what the future may bring. The study used climate models supported by the North American Regional Climate Change Assessment Program, along with a hydrology model to examine the impact of wetlands during the climate scenarios for a mid-century period from 2041 to 2070. It suggests this central Indiana region could see continued increases in extreme events, such as more extremely hot days during summer and more heavy rain in the wettest 5-day periods. "There's some variation in the models, but there's general agreement that the future will bring more heavy precipitation events," Babbar-Sebens said. "How we transfer and store runoff on the landscape is going to become even more critical." "From the perspective of a decision maker, an advantage of wetland construction is that it would significantly reduce flooding from heavy precipitation in almost every possible scenario. Wetlands are consistently effective." An obstacle at this point, she said, is that many incentive programs that support wetland restoration and creation usually focus on ecology, wildlife enhancement and water quality issues - and there are limited funding mechanisms to create upland wetlands for flood management. This limits the economic incentives for farmers and landowners to set aside room for wetlands, especially with the high price of agricultural crops. New financial models and flood management policies would probably be needed to address this, Babbar-Sebens said. Deforestation, agriculture and the historic growth of cities with impervious infrastructure have hugely changed the face of the Midwest and its hydrology, leading to frequent floods. Climate change is now exacerbating that problem. In 2011, Indiana experienced record-breaking heat in seven counties, record-breaking rainfall in 22 counties, and record-breaking snowfall in six counties. The state has been declared a flood disaster area 14 times between 2000 and 2011, compared to only four times in the decade prior to that. The great Mississippi River flood of 2011 was considered a "500-year event" and caused $2.8 billion in damage. It flooded more than 21,000 homes and businesses and 1.2 million acres of agricultural land, according to a report from the U.S. Army Corps of Engineers. Wetlands help reduce some of these flooding problems by storing water away from stream channels and releasing it more slowly, while also improving water quality and providing wildlife habitat. Other studies have shown that wetland construction in the Mississippi-Ohio-Missouri river basins could also significantly reduce nitrogen loads in the rivers, which has led to an enormous "dead zone" in the Gulf of Mexico. A methodology for evaluating wetlands with respect to historic climate and future climate scenarios, created in this research, should be applicable to other watersheds in the Midwest, researchers said.